Honicel paper honeycomb is an appropriate, strong and lightweight core or filling material in room- and space partitions. With Honicel paper honeycomb there is no necessity to bond traditional multiple layers together anymore. Sandwich panels filled with Honicel paper honeycomb offer a solid and robust look while being easy to manoeuvre and handling is less demanding in manpower. Honicel paper honeycomb filled partitions can easily be fitted up aided by the use of hollow core anchors. 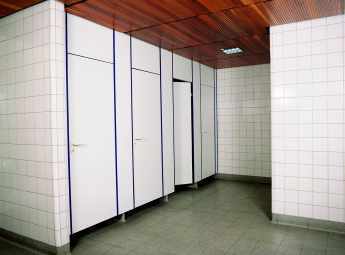 Plasterboard partitions or partitions with a wooden or melamine skin are widely used as exhibition walls on fairs and as partitions in office accommodations.